Trying to get to the Stuttgart area from Dublin has become considerably more challenging in recent years. Various airlines have operated direct flights in the past, not least Aer Lingus and Hapag-Lloyd Express, but nobody operates the route any longer. The Irish Tourist is left with a choice between two equally unpleasant alternatives; connecting flights, or small obscure airports in the middle of nowhere. Nobody wants to have to connect flights for a weekend break, as any delay runs the risk of a ruined holiday. Conversely, small airports are often only served a few times per week, making it difficult to get to where you want to be at a suitable time. It was thanks to the latter problem that our weekend trip had an outbound flight to Friedrichshafen, followed by a return flight from Karlsruhe-Baden. Fortunately there was no additional charge for a one way car rental. 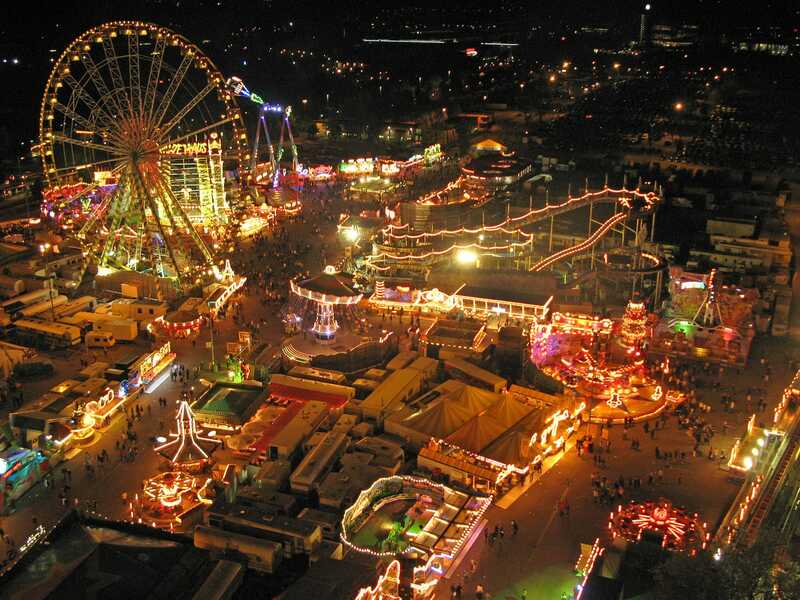 No coaster enthusiast ever needs an excuse to justify a trip to a German fair. Even still, were one to be requested, two words would be sufficient; Olympia Looping. Anton Schwarzkopf's crowning achievement remains as amazing today as it was when it debuted nineteen years ago. It was only running two trains today, but the crowds were insufficient to demand more. We waited no more than five minutes for our seats, and we'd been in them only a few seconds when the train was duly dispatched. The speed of loading on German fairs borders on the frightening; it's a great pity that major amusement parks don't appear to be able to match it. 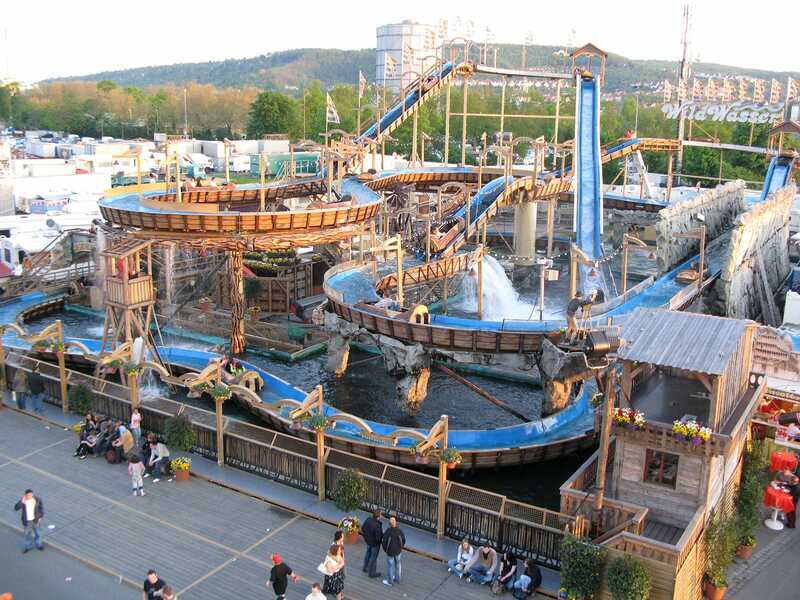 The next significant attraction we tried was Wildwasser, a ride which could simply not exist anywhere else in the world. The typical fairground log flume is a simple affair with two drops and a maximum height of about sixty feet. Wildwasser has two forward drops, a backward one, tunnels, and assorted high quality animatronics. It also occupies at least four times the surface area of its smaller brethren. Needless to say we enjoyed this a lot, even if those of us without waterproofs paid for their hubris in style! Ewald Schneider's magnificent Power Tower 2 made a guest appearance at Funderland Dublin a few years ago, and it was nice to renew the acquaintance. The tallest portable drop ride in the world hasn't changed at all, even down to the occasional English lets do it and one more time from the ride operator pronounced in a thick Bavarian accent. The ride is much more of a family attraction than its statistics might suggest, as there is no freefall involved, but it remains energetic enough for thrill seekers to enjoy too. Cars on Spinning Racer were being dispatched no more than five seconds after arrival at the station, giving guests no more than three seconds to sit down before the lap bar was shoved into place. One got the distinct impression that any delay to the military precision would result in decisive action! Both our circuits today involved only limited spinning despite our best efforts to balance the car. Even still, however, the ride remains one of my favourites. Höllenblitz is the latest retheme of what was Star World. My trip report from that time wasn't overly flattering about it. However, the owners have made some major changes which greatly improve the overall passenger experience. The most significant is what I'd almost describe as a launch section at the top of the lift hill. The train is accelerated over the top with considerable vigor into a first drop which descends much further than in its previous incarnation. The result is a lot of fun, even if I'm still not entirely sure of the purpose of the LED christmas trees inside the ride shell. The new theming on the outside can only be described as stunning. It's still not the best coaster on the German fairs, but it's considerably better than it was. Fairground fun houses are often a waste of time, even in Germany, but we had been told about one exception to the rule. All visitors to the Lach Freu-Haus were issued with some rather frightening glasses that simulated what I'm reliably informed are the effects of psychotropic substances. The moving walls and floors within were standard enough, but they were executed with a panache that was truly special. The highlight was the inevitable rotating barrel; these can be quite a challenge to walk through, as Ann will no doubt be glad to testify! Wilde Maus (#1154) was being run with no trim brakes at all, and for us this was not an advantage. We put the combined weight in our car at something approaching sixty stone, and the results were inevitable. Every corner resulted in a slam to the side that went from being moderately painful to oh my god that hurt by the end. The only saving grace for me was discovered later; it was in fact a different version to the one I'd ridden in Hamburg a few years ago, marking an unexpected new credit for me. The only spin ride of the day was taken on XXL, still one of the most impressive looking spin rides on the fair circuit. It did feel to be on the verge of needing another new gearbox; each direction change brought with it a mechanical shudder that was more than a little unsettling. Nevertheless it was still an awful lot of fun, and one that hopefully will make it to Irish audiences at some stage. There were one or two other spin rides that looked interesting, but the standard German fair rule applied; if there is no queue, do not consider riding under any circumstances unless you wish to spend fifteen minutes on board!